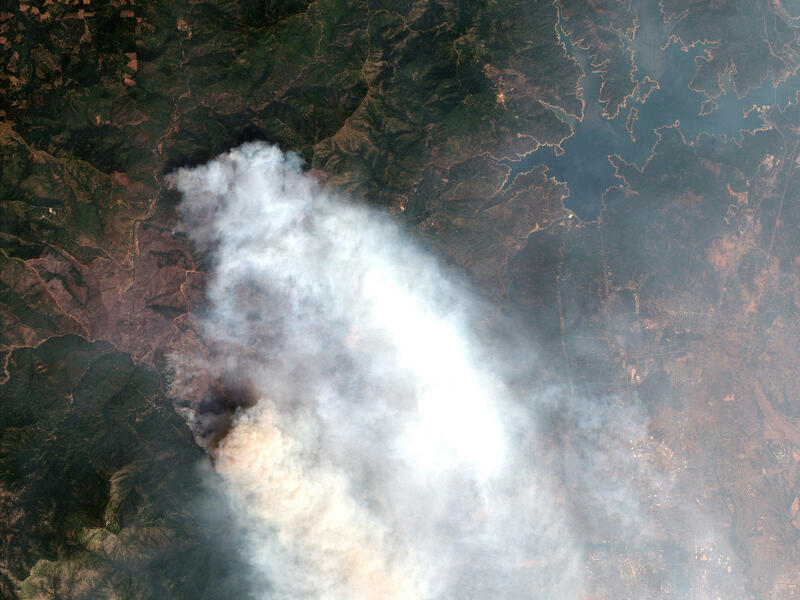 A satellite image provided by DigitalGlobe shows the Carr wildfire in Redding. UPDATE: WEDNESDAY, AUG. 9, 10:00 a.m. -- CalFire reports this morning that a heavy equipment mechanic assigned to the Carr fire died this morning in a single vehicle traffic accident on Highway 99 in Tehama County. The victim was identified as Andews Brake, 40, of Chico. Brake was a six-year veteran of CalFire. The Carr fire is still growing, albeit relatively slowly. This morning, the total areas burned is 177,450 acres. Containment has crept up to 48 percent. Fire officials say heavy fuels and rugged terrain have made the work of creating containment lines a slow slog in high heat and thick smoke. Due to extremely low fuel moistures in grass, brush, and timber, the potential for fire growth remains. Firefighters have been conducting burnout operations to strengthen control lines as conditions allow. The relatively remote location of the fire's edge means there are fewer structures currently under threat. The count now stands at 528. For the latest information on evacuations, road closures, emergency shelters and more, click here. For links to fire recovery assistance, go to the Carr Fire Local Assistance Center. UPDATE: WEDNESDAY, AUG. 8, 10:00 a.m. -- Firefighters continue the slow process of containing the Carr Fire. Overnight, it grew slightly, to 173,522 acres. Containment remains at 47 percent. Fire managers are keeping a wary eye on the weather, which is expected to get somewhat hotter and windier for the next couple of days, before slacking off later in the week. Crews have been working in steep, rugged terrain to strengthen containment lines to withstand possible active fire conditions brought on by the increased temperatures and winds. Each day, more evacuation orders are being rescinded and reidents are being allowed back into their neighborhoods. Only two of the five emergency shelters set up to handle evacuees remain active, at Shasta College in Redding and Trinity High School in Weaverville. The number of residences destroyed by the Carr fire remains at 1,077. The number of structures threatened hass been reduced to 935. UPDATE: TUESDAY, AUG. 7, 11:00 a.m. -- Fire crews have been taking advantage of the relative mildness of the weather to make slow gains on the Carr Fire. This morning, containment has inched up to 47 percent and the fire growth has coninued to slow, reaching 167,113 acres. That's less than 4,000 acres since yesterday. Firefighters will continue to focus on strengthening containment line on the western edge of the fire, from Igo north toward Lewiston and around to the north east. The fire is currently located mostly in steep terrain with varying wind exposure, which is complicating efforts to establish containment line. When winds line up with valleys, that can funnel winds into drainages and make fires more active. CalFire's John Clingingsmith says the hotter, drier, windier weather expected over the next few days is expected to make those efforts more difficult. "We've had that kind of rollercoaster throughout the fire from the start," he says. "We were having very high winds, higher temperatures, lower humidities. Then it kind of settled down for us a little bit. Then it came back, we went into a Red Flag Warning, then off of Red Flag Warning. So that's been the biggest challenge so far." No more homes have been found destroyed by the Carr Fire so far; the current total stands at 1,077. But CalFire lists over 1,800 structures still thretened. UPDATE: MONDAY, AUG. 6, 11:30 a.m. -- Continued hot, dry weather is still fueling the Carr Fire near Redding. But the fire's progress is slowing and fire crews are slowly gaining containment. As of Monday morning, the fire had grown to 163,207 acres and was 45 percent contained. The number of homes destroyed is holding at 1,080, but 1,223 remain threatened. Areas of heavy timber and steep drainages are challenging firefighting efforts. especially along the northern and western sides of the fire, where the communities of Lewiston and Weaverville remain under threat. Firefighters will continue to work to stop potential spot fires over control lines. Repopulation of evacuated residents will continue as conditions permit. ORIGINAL POST: SUNDAY, AUG. 5 ... A seventh person died due to the wildfire called the Carr Fire in Northern California. A Pacific Gas & Electric Company spokeswoman said an employee died while trying to restore power in a rural area of Shasta County. The apprentice lineman — Jairus "Jay" Ayeta — died in a "car incident," the spokeswoman said. She would not specify what kind of incident. He was 21 years old. A GoFund Me memorial campaign has been set up for his family. The company has almost fully restored power in the city of Redding, which was hardest hit by the fire when it became so hot that it generated a tornado of flames and smoke. The fire flared up again in the town of French Gulch over the weekend. The fire’s northwest section in rural, rough terrain is challenging firefighters. They have almost contained half the fire spanning tens of thousands of acres. The Trump administration declared a "major disaster" in California as the state fights these massive wildfires. The declaration opens up federal funds to help Redding recover. As of Sunday morning, the fire was about 150,000 acres and 41 percent contained. It has destroyed 1,000 homes. The fire started July 23 when a trailer's tire popped, causing its rim to scrape against asphalt and sparking flames on California Highway 299 near Carr Powerhouse Road at Whiskeytown Lake.